Clintec wins Scale-Up Business of the Year award at MSDUK conference, sponsored by The Coca-Cola Company. We are thrilled to announce that Clintec won the Scale-Up Business of the Year at the Minority Supplier Diversity UK (MSDUK) Awards Dinner on 26th September. 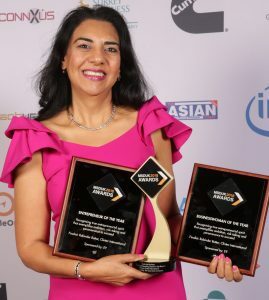 Clintec Founder, CEO and Chairman, Dr Rabinder Buttar was a finalist in a further 2 categories, Entrepreneur of the Year and Business Women of the Year. Clintec are proud winners of the esteemed Scale-Up Business of the Year award, sponsored by The Coca-Cola Company. Clintec CEO, Dr Buttar was also a finalist for Entrepreneur & Business Women of the Year Awards. Through these awards, MSDUK honours the efforts of powerful ethnic minority-owned businesses such as Clintec in supporting inclusive and competitive supply chain networks by recognising their innovation, growth and entrepreneurship. Clintec’s growth secured its win in the category of Scale-up Business of the Year, which recognises a business which has shown significant demonstrable growth over the last two years within its operative competitive market. This is exemplified by Clintec’s organic expansion into differentiated, global emerging markets such as Sub-Saharan Africa, MENA, and APAC, as well as US and Europe. Over 770 Clintec personnel are based in over 50 countries worldwide, and the company doubled its profits in 2017. Clintec were joined winners with Fortel and extend their warm congratulations to Fortel and finalist, Gibbs Hybrid. Clintec CEO, Dr Rabinder Buttar was a finalist for the Entrepreneur and Business Women of the Year, sponsored by Ernst & Young. The Business Woman award identifies and defines the qualities of a successful business woman, including her drive, vision, tenacity, leadership and confidence, whilst the Entrepreneur of the Year award celebrates entrepreneurs with ambition, inventiveness and inspirational leadership. Dr Buttar is renowned for her entrepreneurial leadership and corporate success in clinical research. As one of Strathclyde’s Founding Entrepreneurs, she delivered the Global Symposia for Entrepreneurship Educators (2017) and was admitted into Strathclyde University’s UK Academy for Distinguished Entrepreneurs for her work in founding and leading Clintec to become the most geographically diverse mid-market women-owned CRO in the world. Dr Buttar recently won Ernst & Young’s Entrepreneur of the Year Award for Scotland (2018). Fellow finalists in the categories of Business Woman and Entrepreneur of the year included Farida Gibbs, CEO, Gibbs Hybrid and Naheed Afzal, Co-founder & Director, Contracts IT Recruitment Consulting, as well as Raj Tulsani, CEO & Co-Founder, Green Park Interim, and Naheed Afzal, respectively. Clintec extends a warm congratulations to Raj Tulsani and Farida Gibbs on their wins. “I am delighted for Clintec that we have, collectively, won and been recognised for these awards. These acknowledgments are a true reflection of Clintec’s diverse, innovative people based in over 50 countries globally, who provide excellence in clinical and business operations every day. Well done to everyone. Congratulations to my friends, Farida Gibbs, Naheed Afzal and Raj Tulsani, who made exceptional running partners and are inspirational entrepreneurs in their fields. Clintec International is a global mid-market full-service CRO founded in Europe in 1997, which has grown its presence into over 50 developed and emerging countries. Clintec is positioned as one of the most geographically diverse mid-market CROs, with deep expertise in advanced functional outsourcing models for clinical research. Clintec provides innovative full-service and functional outsourcing clinical research solutions to 7 of the top 10 pharmaceutical companies in the world, as well as speciality biotechnology and medical device firms in oncology, rare diseases and other therapeutic areas. In addition, Clintec has a strong agenda for social responsibility, diversity and inclusion, by providing clinical research solutions in diverse geographic locations inclusive of Sub-Saharan African countries, aligning with not-for-profit organizations, to develop medicines for infectious diseases in countries where significant unmet needs exist. Headquartered in the UK and now in its 21st year of significant global expansion, Clintec’s focused, flexible and forward-looking approach ensures quick and reliable results customized to the global clinical research needs of its clients.